Cream the butter, warming it a little as necessary, to make it soft enough to work with. Sift in the icing sugar and cocoa, and mix. Chop the sultanas on a board, with some of the coconut. This makes the sticky cut fruit easier to handle. Mix the coconut and cut fruit into the butter mixture and add extra flavourings if desired. Chill the mixture if necessary to make it easier to handle. 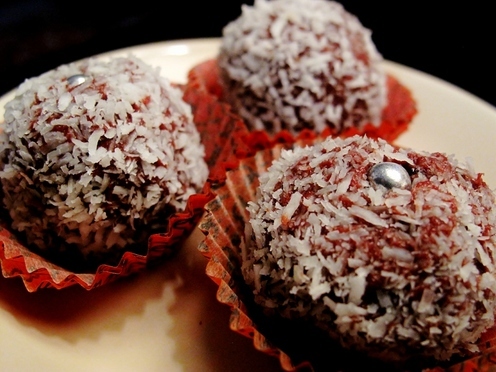 Form into small balls with a teaspoon, and roll into more coconut. Place the finished balls on a tray, flat plate or in little paper cups, uncovered, in the refrigerator for several hours or until really firm then store in a jar or tin in the fridge. Put layers of parchment paper in between if many are made and remove from the fridge just before serving. YUMMY! Best enjoyed with great friends, a cup of coffee, or….a discerning Arab cat. 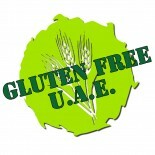 This entry was posted on 06/02/2012 by glutenfreeuae in Recipes, Sweets and tagged chocolate, gliten free, glutenfree, truffles, YUM.